The wicked counterpart to the Hulk, Abominations monstrous physique is also due to gamma radiation exposure. Real name Emil Blonsky, this evil mutant debuted in 1967 and has since appeared in video games and animated TV shows as well as the 2008 Incredible Hulk movie. At Superheroes Direct, we bring fans of this evil green antagonist a variety of quality collectibles and apparel, including paperweights, drinkware, t-shirts, and more. Many of our products feature the Abomination as part of a team of supervillains opposing the Avengers, such as our Avengers Assemble Drinking Glass Set and our Avengers Assemble Villain Fill In T-Shirt. Our Avengers Villain Heat Change Mug reveals Abomination alongside other villains as it warms up. Keep checking back here at Superheroes Direct for more updates to our Abomination category. Transformed forever by gamma radiation, this supervillain possesses strength greater than that of the Hulk. 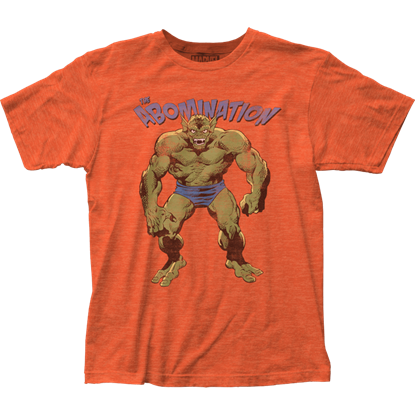 Fans of the Incredible Hulk series will enjoy the comic book image presented by the Marvel Comics The Abomination T-Shirt.